Remember when the Pentagon let the F-35 start flying again, even though its underlying defects hadn't been fixed? 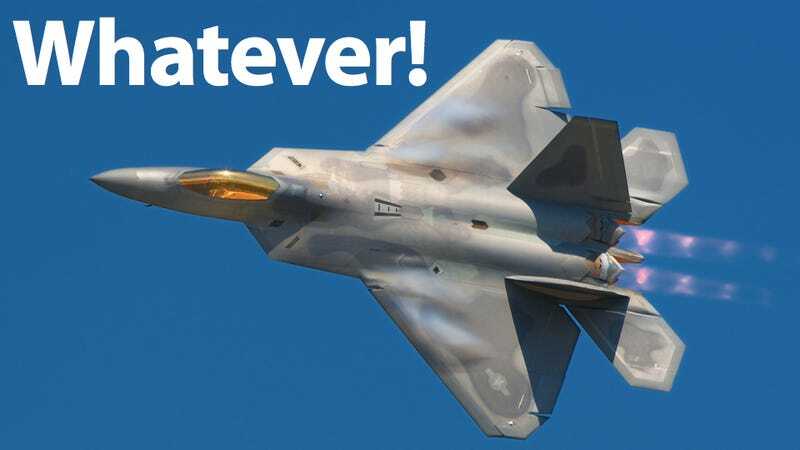 They just did literally the exact same thing with the F-22 Raptor. Hope you're not worried about oxygen deprivation. This past spring, the country's entire $62 billion F-22 fleet was grounded after pilots reported symptoms of oxygen deprivation. That's indicative of flawed design, and a serious risk even during peacetime. So what has the Air Force done to get its expensive wondertoy back back in action? Nothing. Absolutely nothing. But that's not going to stop them from throwing the things back into the air anyway—you see, we'll all just forget about the possibly-fatal oxygen deprivation issues. Instead, we'll just kinda see how it goes! The return-to-fly plan implements several risk mitigation actions, to include rigorous inspections, training on life support systems, and continued data collection.The aircraft is capable and authorized to fly above 50,000 feet. Pilots will use additional protective equipment and undergo baseline physiological tests. The return-to-fly process will begin with instructor pilots and flight leads regaining their necessary proficiency, then follow with other F-22 wingmen. Prior to the stand down, ACC officials convened a Class E Safety Investigation Board in January 2011 to look into hypoxia-related reports. At the same time, a Hypoxia Deep-Dive Integrated Product Team began an in-depth study on safety issues involving aircraft oxygen generation systems. In June 2011, the Secretary of the Air Force directed the Air Force Scientific Advisory Board to continue the oxygen generation study concurrent with the ongoing SIB. A releasable report will be made available later this year.